Evasion Mont Blanc Airport Transfers from Geneva with Ski-Lifts! 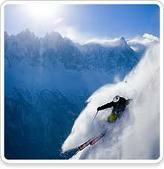 Simply get your quote for an airport transfer to the Evasion Mont Blanc area from the quote generator and book online. A very little known but huge ski area. The reason for this is because the resorts that are within this area tend to advertise themselves separately. The resorts involved are Megeve, St Gervais, Les Contamines, La Giettaz and St Nicolas de Veroce. The Evasion Mont Blanc ski pass covers the following areas: Rochebrune, Cote 2000, Mont-d’Arbois, Jaillet, La Giettaz, Saint-Gervais, Saint-Nicolas de Véroce, Combloux, Les Contamines and Cordon providing 445 km (276 miles) of pistes which are serviced by 107 skilifts. Between these you will be able to find a resort to suit almost every person and pocket. From the uber rich clientele of Megeve to the family friendly resort of Les Contamines – there is something for everyone. This also applies to the skiing; however watch out for the shorter season due to the lower height of the resorts which can also mean links between areas are closed.